SUSAN ELIA MACNEAL: During my last week on Jungle Reds, we talked about typewriters — now let's chat about fonts. 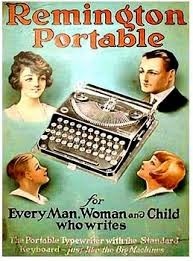 The font at the heading of my blog and website is from a Remington Noiseless Portable typewriter, probably similar to those Winston Churchill's typists, such as Elizabeth Layton Nel, used. 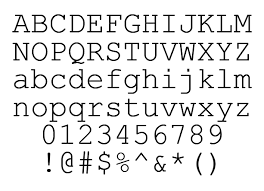 The font was recreated for the computer by antique typewriter aficionado and expert Richard Polt. According to Richard, the font was created from his own "beloved Remington Noiseless Portable Model Seven.... Using fontifier.com and a scanner [to create a] Remington Noiseless Truetype font that you are welcome to download." For all of us who love fonts, particularly old typewriter fonts, thank you, Richard! And so lovely Reds, I ask you — what font(s) do you work in? Do you ever switch them up? Does your agent/editor have a preference? And if you could use only one for the rest of your life, what would it be? HALLIE EPHRON: My favorite font is old fashioned typewriter like Courier or Courier New. I think because it feels like someone actually had to hit a key to make each letter appear. But I don't use it for manuscripts - for that I I'm with you on Times New Roman. Big enough to read, please, which means 12 point. But on the Web I'm perfectly happy with Helvetica or Arial. sans serif fonts. Fancy fonts quickly become unreadable. HANK PHILLIPPI RYAN: Oh, gosh, at work our Outlook is set (for everyone) to Calibri, which I am not fond of, and as a result I spend half my time changing each email so it's back in Times New Roman. And I've always wanted to do a story where the character writes in WingDings, and then the recipient has to "translate" by changing it back. I'm fascinated with WingDings. The first edition of my first book had the titlepage in --oh, rats, what was it called? Zapfino? I've blocked it. I thought it was AWFUL. But now I see it everywhere. And calligraphy/script, sorry to say, never is very successful. NOT to mention impossible to read. RHYS BOWEN: Very boring Times New Roman, please. As long as it's big enough and easy to read I confess I don't notice. I have used Parisian in some flyers and postcards as it is deliciously art deco. DEBORAH CROMBIE: I was taught that manuscripts should be formatted in Courier New, and that's how I still do them---12 point, which is easier to read than Times New Roman 12 point. I love the typewriter font, and for me, the space between the letters makes it very easy to read when editing or proofing. For everything else I use Times New Roman, or sometimes Arial, except for our personal Christmas cards which we now send as e-cards. We use a fun serif font--I can't remember what it's called. But it's legible. Do you suppose people still submit manuscripts to agents in weird fonts and on weird colored paper? Horrors!!! 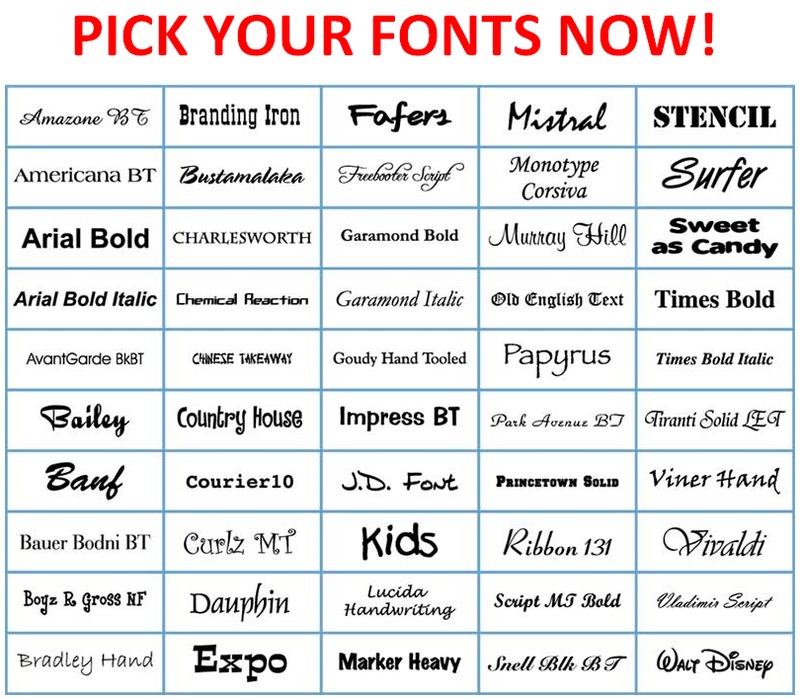 Lovely readers, do you have a font preference when you write? When you read? Are there any fonts that drive you batty? (For me it's Comic Sans — shudder....) Please tell us in the comments! If I were submitting a manuscript, I'd use the Times New Roman which I see you've mentioned as the one to use . . . but I am definitely not a fan of the font. My go-to font for everyday stuff is Century Gothic which is very much like "real" printing. Must be all those years in first grade . . . .
Times New Roman for manuscripts and letters, Ariel for e-mail. For uploads like this, whatever you've set. I prefer Ariel Bold Italic 12 or 14. I like Adobe Garamond, but often use Times New Roman because it’s in everyone’s computer. I think we could come up with some "You only get ONE rules..."
Aren't fonts fun?? Patti Callahan Henry wrote a novel about a woman who owns a letterpress studio and makes artsy cards, invites, etc. It goes into just enough detail about the world of fonts and how different ones are matched up to the art, the occasion, etc of a particular piece and it's fascinating. I try to use something a little on the fancy side to sign my collages and photographs, but fancy with restraint. I suspect the strawberry-scented pink paper was just a distraction to prevent anyone from noticing the content of the manuscript. LOL. Times New Roman here a well. Though, like Rhys, I'm generally ok with just about anything that is readable. Please don't send me an e-mail in fancy cursive font, I simply won't take the time to read it. As a former graphic designer, I love fonts! I used to be able to name them at a glance, but there are far too many now. Useless factoid of the day (always share this with my academic writing students): somewhere sometime a study was done that shows serif fonts (Times New Roman, Courier) are easier to read on the printed page (the serif pulls your eye along the line) while sans serif (Arial, Tahoma) are easier to read on the screen (because of pixelization). Back to NaNoWriMo 2014 - in Times New Roman! Yes, 12 point is getting "smaller", isn't it? When choosing a typewriter for college in the 60's I had a choice of two fonts. One was a 10 point and the other was 12 point. I chose the 12 point because most assignments were for x number of pages and a larger font would fill the page faster! Times New Roman for just about everything, yes. Courier looks too light to me, and therefore is hard on the eyes. But I have to confess I use Comic Sans for my Kate Emerson Historicals website. I just like the way it looks in a non-mystery setting. I thought about changing it when I learned how many people do dislike it, but I have a lot of material there and it wouldn't just be a case of select all and change font. Interestingly, on my iPad, the text automatically views in Times New Roman. Ah, Cyndi, that explains why! I adore fonts. Yes, I'm a "font fondler" For fancy stuff, like special cards or certificates, I like calligraphy style fonts. For my writing, I use Scrivener's default font - I can't remember the name of it But it's a typical serif. I love Garamond - it's so elegant and easy to read on a printed page. Online I prefer Helvetica; more polished to me than Arial. When I submit something, it's Times New Roman. Fonts I hate? Courier (bah, no character) and Comic Sans. Worst thing I ever saw printed was a poster with multi-color Comic Sans. Kim, that's so great you still have an actual typewriter! Some friends of mine and I have declared Comic Sans as the sarcasm font. Century Gothic is our approved font at work so everything has to be that. When I write things at home, it's most often Times New Roman or Garamond. I am a big fan of Calibri for my personal materials -- to do lists, etc. Tahoma or Verdana for emails. I am fond of contemporary looks that are clean and easy to read. We chose Georgia for the eBook version of my mystery, Murder Becomes Manhattan. Similar to Times New Roman and very easy to read it seems on Kindle, etc. My preference is Times New Roman as well. When I got my new computer a couple months back, the first thing I did was set the default to that. Jeffrey, when I self-published my first book, in 1994, the woman who designed my cover used Poppl-Laudatio. And until this moment, I could not have pulled that name out of the dim recesses of my mind, so thank you for the mental nudge. She was a Mac-only person, and at the time that font was either not available for PCs, or it was outrageously pricey. I think I used Garamond for the text. One thing I learned from that experience was that font treatments, ie, italic, bold, etc, also count as "different" fonts. I use Times New Roman or Arial for almost everything, except for recipes I copy into word docs. They have a special set of fonts, both to make everything look the same and to make lists of ingredients easier to read. Jeffrey, I thought that I was going to be the only Calibri fan here. I use it on my Word documents and find it an easy to read font. I usually put it in bold because I've gotten used to it, and the normal setting seems so light now in any font. Another area that is different for me is that I rarely use a 12 point font anymore. I usually use 16 or 18 on my personal lists and documents. I like it big and bold. I love that the Jungle Reds blog brings up topics that are so interesting, but that I might not have stopped to really think much about before. Susan, thanks for a fun post. I just had the thought that if I told someone else I was discussing fonts on a blog today that they might not get how much fun any topic can be here on Jungle Reds. Oh, and I love the old typewriter font at the top of your Web page and blog, Susan. Thanks for giving us the history on that. I'll be looking up that font. Oh, and I was busy with grandkids all weekend and missed commenting on the two fabulous posts on Saturday and Sunday. So, briefly, I love Outlander, and Kaye's boots are gorgeous. I prefer Times New Roman or Arial. 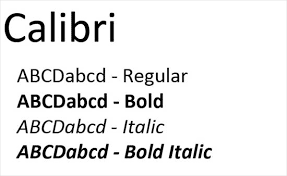 The default on both my home and work computers is Calibri, which I HATE. 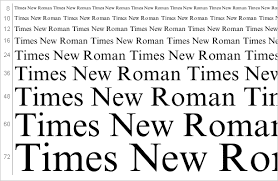 I thought I had successfully changed the default to Times New Roman on my home computer, but after a couple of weeks it decided to change itself back to Calibri. Sometimes I'm typing in Times New Roman and it changes itself to Calibri! For personal emails I often use Comic Sans MS or Century Gothic. For work emails I change from Calibri to Arial or Times New Roman. I use Time New Roman 14 for manuscripts (I change to 12 pt when I print or send it out), for e-mail I use Ariel 12 or 14. For all other things, I used Verdana 14 pt. I believe it was Robert Olen Butler who advised using a strikingly different font for creative work than for other purposes. It gets you into a different head space. I use unexceptionable Times New Roman for my freelance gigs and sans serif Calibri for fiction. Susan, this topic is perfect for my household. My husband runs a university press and has his own press, and I spent a lot of years doing freelance editing/copyediting, so we've been known to get in heated discussions over fonts that last for hours. For professional work, I use 12 pt Times New Roman. Though for printed-out letters, I prefer Garamond. I set my Word viewing preferences at 150%, so I don't have to resize the font to send on manuscripts but still can work with more easily visible fonts. I, too, hate the Calibri that is Word's default. It's lovely to be back with my favorite group again after a really rough summer and early fall. And to come back in on a discussion of fonts was just perfect! Thanks for prompting the conversation, Susan! It seems many of us are in the same camp, or at least adjacent ones. For my own writing, I use Times New Roman, too, simply because I associate it with postgrad days writing a dissertation on a tiny Apple Mac Classic. But for email, I stick with whatever sans serif font has been preselected by Microsofties (so that's either Arial or Calibri). Perhaps I'm wrong here, but my thinking is that if it's in a default font, the reader is more likely to attend to the content than start wondering what the font is or why I changed it. I LOVE Comic Sans for personal drafts. It's whimsical. Gets a bad rap!